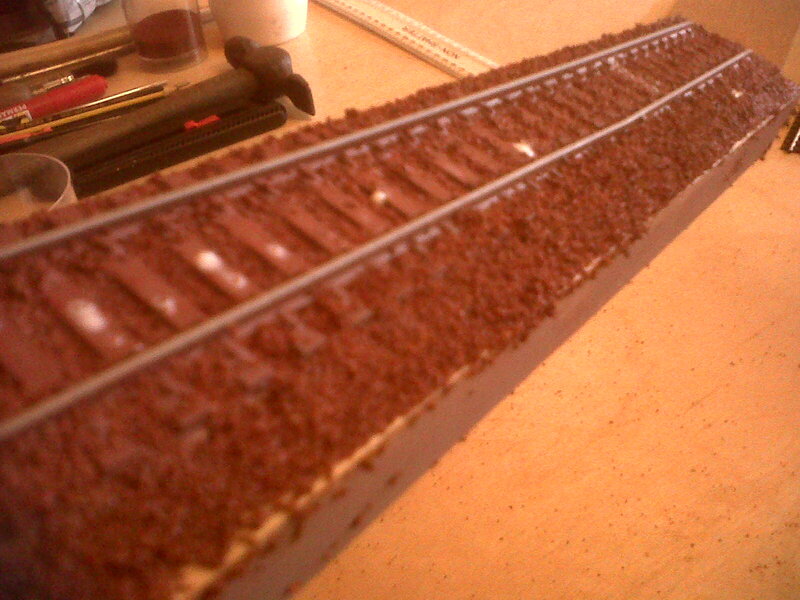 Ballast is the collective name for all those stones that railway tracks are laid upon (just in case you didn't know). For model railways you can buy the stuff in bags of either grey or red and in either fine, medium or coarse grain. The chap who sold it to me in the shop recommended fine grain although I thought it looked like dust rather than scaled down stones. However, he showed me some photographs of HO scale track he had ballasted with the stuff and I had to agree that they looked like photographs of real railway tracks, (maybe they were!). On youTube most folk use medium grain. 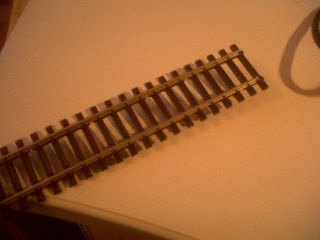 I followed the instructions on the excellent Everard Junction youTube tutorial. 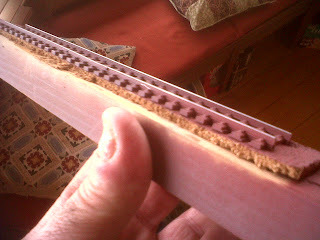 Cut away the cork underlay up to the edge of the track so that a raised shoulder can be created when the ballast is poured over. 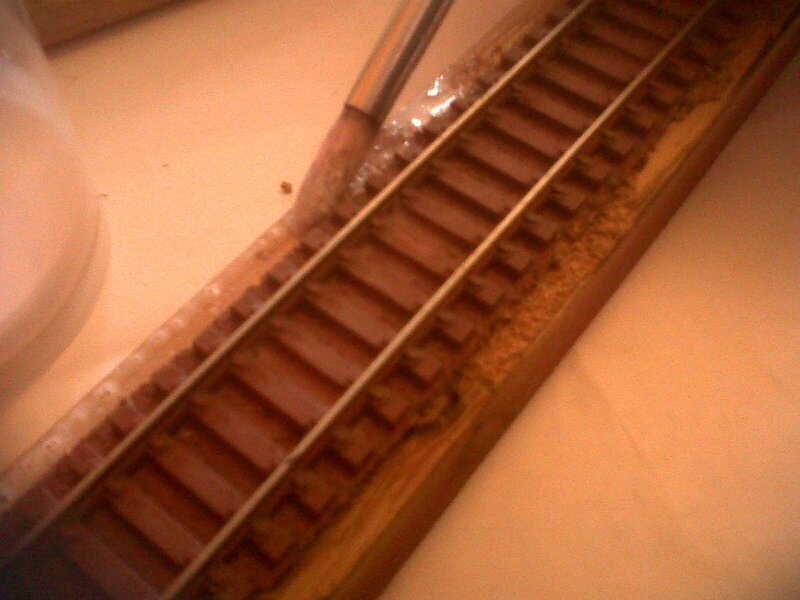 Mix up some PVA glue with same amount of water and some fairy liquid and brush a strip of glue along either side of the track to stop the ballast spreading over the edge of the wooden base. 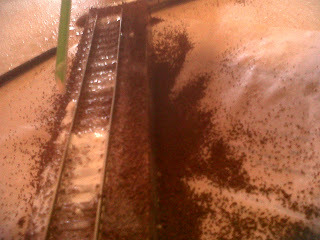 Pour the ballast over the track so that it spills over either side to make a raised shoulder. 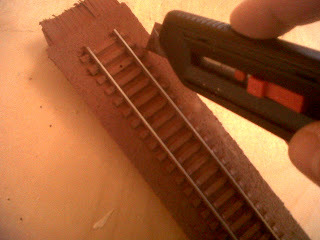 Run a dry brush back and for along the sleepers to distribute the ballast AND KEEP IT AWAY FROM THE INNER FLANGES OF THE TWO RAILS. 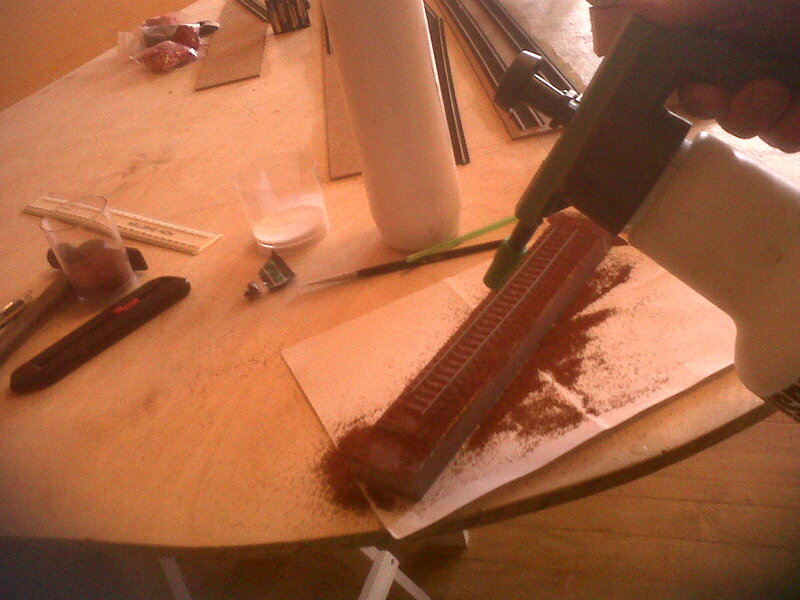 Then, for some reason, one is advised to spray water over the ballast. NOTE: don't use as powerful a spray as I did - soaked the floor and nearly slipped onto my backside. 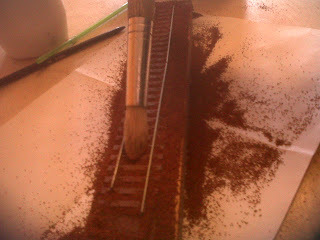 Then drip the PVA glue along the centre of the track and along the sides as well. 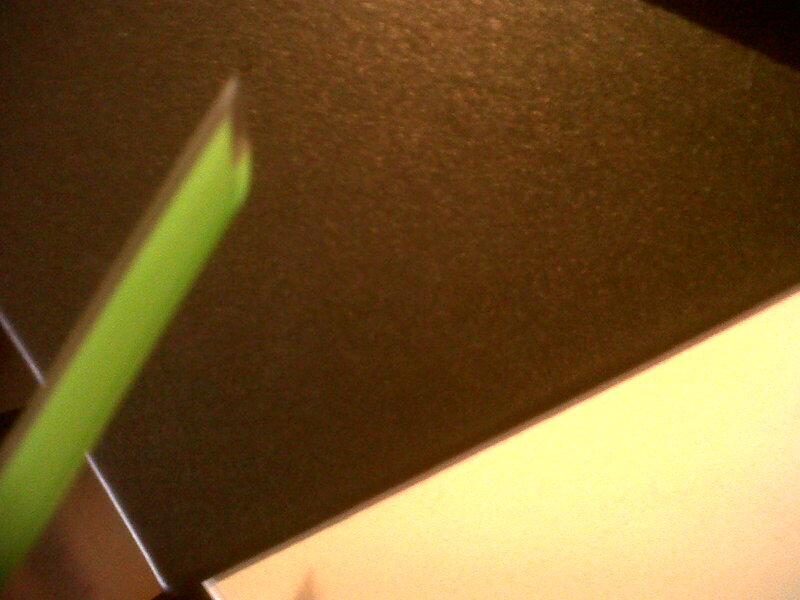 Most people recommend doing this with either an eye-dropper or a syringe. 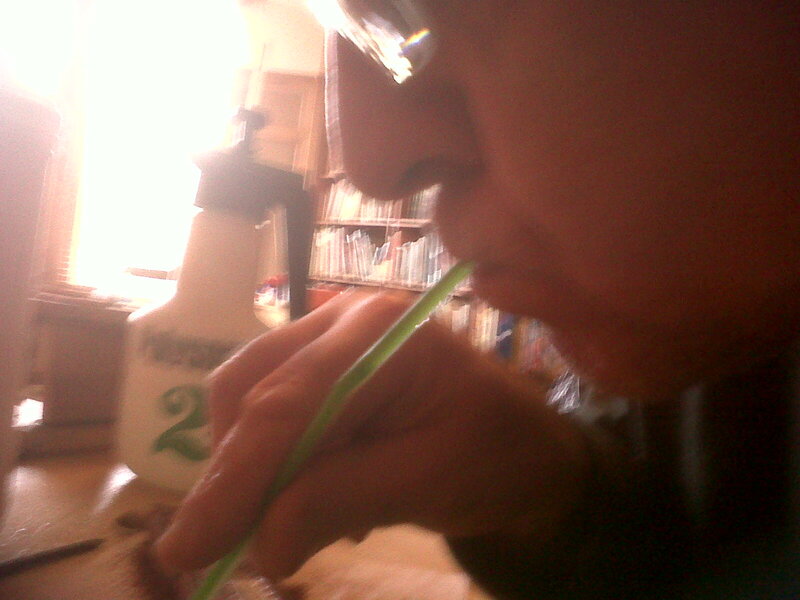 I had neither but found that a plastic straw with a diagonal cut made across one end of it, made a good tool to use. 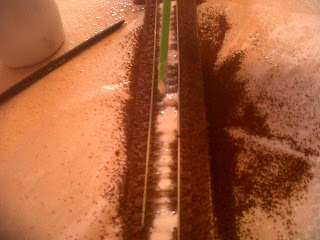 One then sucked up the PVA as one would with a pipette and dripped it over the ballast. Diagonally cut end of plastic straw. A bit heavy handed with the PVA. So far - quite a mess. Wait patiently for glue to dry and then, in my opinion, re-weather with spray paint. 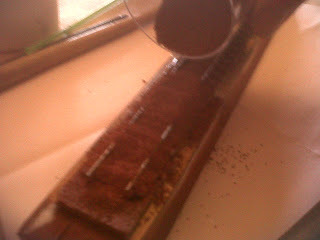 In fact, one is advised to wait for 24 hours and then shake off excess ballast. Here is a photo of the track after 30 minutes. A reminder of a naked section of track. Not sure? Quite like the appearance from an aesthetic point of view, but not sure that the ballast looks like scaled down stones. Will do some additional weathering tomorrow. There is no accounting for taste. I adore Welsh Male Voice Choirs and have had more pleasure from attending their concerts than from almost any other kind of performer. Their live performances are always an accurate rendition of what one hears on a recording with that added vibe that one only gets from attending live music events - hairs standing up on the back of one's neck. 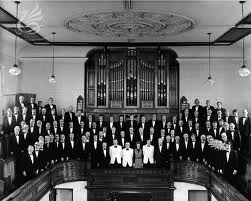 Nevertheless, many people loathe the sound of Welsh Male Voice Choirs. Here is an extract from an article in The Independent about music and goose pimples. "Shiver me timbres, music really can give you goose pimples. People get chills down their spines when they hear certain pieces of music, according to new research, and it may be all down to the working of the body's defence mechanisms. It's been found that people who are more open-minded and open to new experiences are most likely to have goose pimples. Increased loudness of the music, the unexpected start of vocals or instruments, and changes in tempo, are also more likely to make the hairs stand up on the backsof our necks. Music is not the only cause of the chills and goose pimples. Other emotions and sensations – including fear, cold, anger, admiration, emotional memories, excitement and sexual arousal – can act as triggers too. Most people experience goose pimples at some time. Commonly described as a feeling of tingling and shivers, usually on the scalp, the back of the neck, and the spine, they can occasionally spread across much of the body. The technical name for the phenomenon is "piloerection", defined as a visible standing up of the body hair and a poultry-like appearance of the skin's surface as tiny muscles attached to hair follicles contract."